Every year, National University holds a Holiday Cheer event that arranges “adoption“ of a few families within campus communities in Northern and Southern California. Preceding Holiday Cheer, National University nursing students interview the adopted families, gathering their stories as well as lists of their needs and desires. Then Holiday Cheer launches a huge donation drive to collect as many items as possible on each family’s wish list. 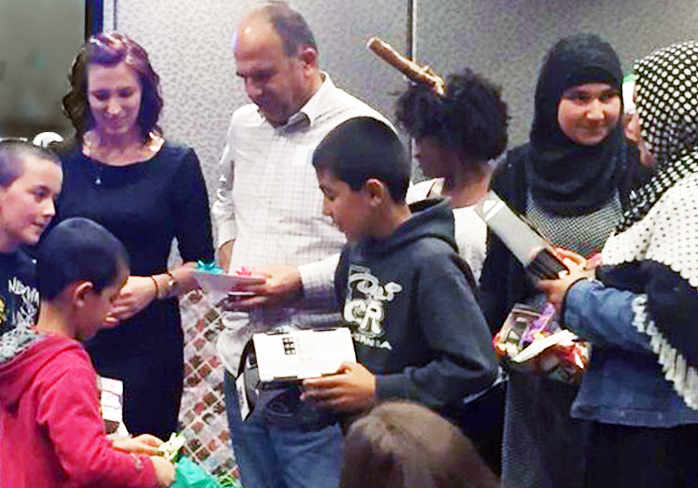 On December 16, 2015, three of Nile Sisters consitituent families benefited from Holiday Cheer. The families are refugees from Burma, Afghanistan, and Nigeria, and all have participated in Nile Sisters employment facilitation programs. Holiday Cheer sponsors took the adopted families to a luncheon and then to a private celebratory ceremony at which each family received numerous items on their wish lists—and a computer! Thank you, National University, for making the holidays brighter for the people we serve, whose resilience, strength, perseverance, and positivity make them so deserving!